Turmeric is a mustard-yellow spice commonly used to flavor Indian cuisine, but it's also used as herbal medicine. Scientists say its active ingredient, curcumin, may offer a range of benefits, some of which pertain to your skin. However, researchers only have animal and test-tube studies to go on. It's necessary to duplicate the results in well-designed human trials to know whether turmeric has skin benefits. The amounts used in studies are higher than typical dietary consumption and are similar to supplemental doses. Curcumin has properties that may help regenerate skin and accelerate wound healing, according to the author of a review published in the January 2013 issue of the journal Biofactors. The ingredient protects skin by reducing inflammation and neutralizing free radicals -- unstable atoms that can cause cellular damage. Curcumin also regulates proteins involved in the healing process of wounds and influences enzymes involved in skin regeneration, according to the review. These properties may benefit a range of skin problems, as well as wound healing. UVA and UVB -- rays that come from the sun -- are known to cause damage to your skin over time. Exposure is linked to skin aging and skin cancer. Researchers set out to determine whether turmeric possesses properties that protect against UV-related skin damage, using hairless mice as a model. The scientists found that turmeric extract given twice daily prevented an increase in skin thickness, reduced skin elasticity and prevented the formation of wrinkles related to long-term UVB exposure -- all related to skin aging. The study was published in the December 2009 issue of the journal Phytomedicine. 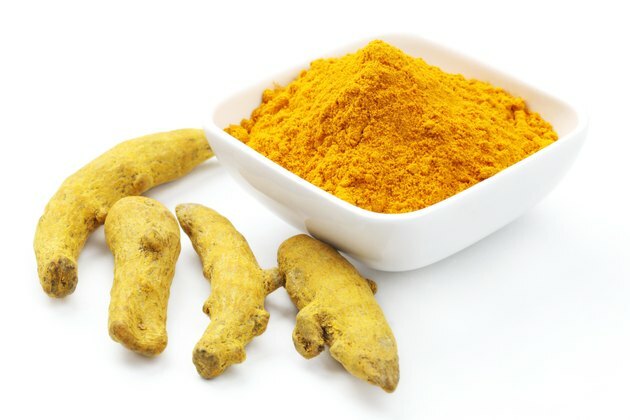 Curcumin appears to have skin cancer-fighting properties, according to an animal study published in the May 2013 issue of the journal Otolaryngology - Head and Neck Surgery. In the experiment, scientists administered oral curcumin to mice for 14 days, followed by UVB radiation three times a week for 24 weeks. At the end of the study, researchers found that curcumin helped suppress skin cancer formation and slowed the onset of tumors. The results warrant further investigation in humans, according to the authors. If you're considering taking turmeric in supplement form, there are potential side effects. Large doses of turmeric may cause digestive problems, including ulcers. Turmeric may lower blood sugar, so it's crucial to talk to your doctor if you have diabetes and are prescribed medicine to control your glucose level. Turmeric may also have blood-thinning properties, which increases the risk of bleeding if you take anticoagulant medication. In addition, turmeric stimulates bile production, which may cause complications if you have gallstones or bile obstruction.